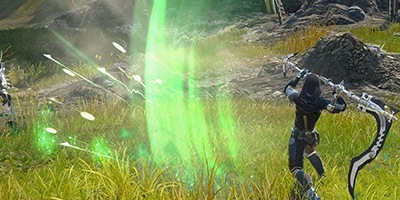 My name is Joey and I currently play as a Necromancer on Skyforge. As a fan of classes that induce damage over time, I was instantly drawn to the class. I am currently around 17k Prestige at the time of writing this article so my experience as a Necromancer is still fairly new and most of this article will be written from the PvE stand point and less about PvP. Why you should play a Necromancer? If you love dealing with death and the macabre, the Necromancer is the right class for you. As a reaper of death, you wield an enormous scythe to cut down your foes and rip apart their souls. The Necromancer excels at damage overtime attacks and summoning minions to help take attention away or help in-dealing damage all the while depleting their own health. Alongside that are plentiful AoEs that also inflict DoTs in a wide area. The sustained damage from a Necromancer doing a full optimized rotation can bring plenty of damage to the table during boss fights and offer some control (fear, pulls, slows, stuns, knockback) of the battlefield against most trash mobs. With sustained damage also comes with high survivability. With access to the ghastly Lich form, the Necromancer is able to escape death and recover all the health lost in several sweeps or attacks. The Necromancer is unable to be killed while in Lich form (though it still receives damage, it doesn’t drop down further below 1HP) and is instantly activated the moment the Necromancer is hit with a damaging ability that would otherwise kill him or her. While the Necromancer excels at providing sustained damage over a long period of time, it lacks the burst damage that most DPS classes provide to the party. When it comes to bosses that require heavy damage in a short period of time, the Necromancer isn’t the class to rely upon. While the Lich form does over a second chance of sorts, it isn’t always guaranteed as it runs on two different cooldowns (noted in the abilities section). 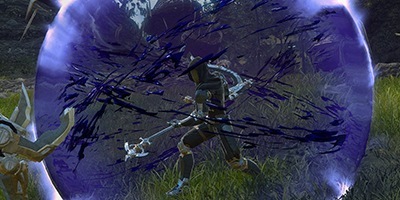 The Necromancer also remains stationary during most of its attacks and isn’t a very mobile class when compared to others. This makes positioning an important part of its gameplay. Basically, if you don’t like being locked down into one spot while attacking, then this class isn’t for you. This is the standard LMB auto attack that delivers three strikes to one foe. All strikes are ranged attacks that can be performed several yards away from the enemy. The last strike, Ritual Strike, can activate an Impulse Chargeto deal extra damage. Rating: 5/10 – While this is your standard auto attacking sequence, it shouldn’t be used much as there are better ways to spend time attacking. 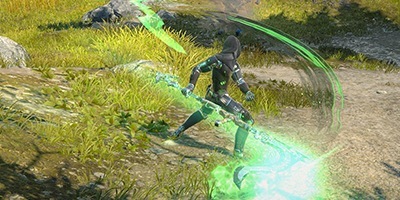 The last strike does have the benefit of an Impulse Charge and gets a 150% boost in damage when traited with Searing Pain but it is not worth the effort nor the talent slot. Hellfire hurls a green inferno towards one enemy and spreads the flames in an AoE of 8 yards around the selected enemy. It inflicts a damage over time effect every second for 5 seconds and activates an Impulse Charge. Rating: 8/10 – Now this is your bread and butter combo that you should be spamming whenever you have the chance. This makes better use of the extra damage from the Impulse Charge as it spreads it in a group and also applies extra damage with the DoT effect and in addition, Hellfire can be traited with Ritual Fire to do 130% more damage. The last strike of this chain summons a plague above the target that constantly damages the selected target every 1.25 seconds for 8 seconds. 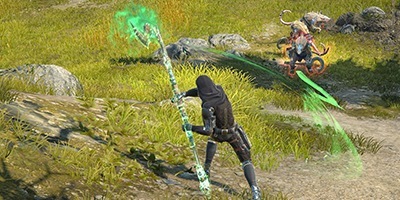 If the enemy happens to be killed while the cloud is active, the targets corpse is sucked up into it and will be available for the Necromancer as an AoE attack for the next 10 seconds. Rating: 9/10 – This will be your main source of damage over time. You will want to keep this up on a target (especially a boss) whenever possible. 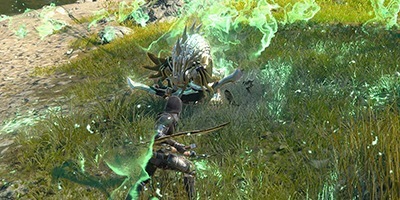 At first, Plague will do mediocre damage but once traited withAccelerated Decomposition, the damage becomes very noticeable as the target’s HP dwindles (starting at 65% to 305% increase at the lowest percentage of health). The extra effect of absorbing the target when they die is a nice addition and provides an extra source of good AoE damage for the Necromancer for the next 10 seconds. The Necromancer raises the hands of the dead in a targeted area of the ground. All enemies within this area are affected by a movement debuff that slows for 50%. Enemies that die within this area are also converted into minions that attack for the Necromancer. Rating: 7/10 – A decent ability that can be used for controlling the battlefield. The slow effect makes it useful for the Necromancer to decimate foes before they can even get up close and personal. This can be traited withCyclone to pull enemies that try to escape the area back towards the center for added control. As with all HP consuming attacks at the Necro’s disposal, this provides 3 Lich charges to the Lich gauge. The Necromancer summons a wall of wailing souls in-front of him and sends it forward in a line that does damage to all enemies in its path and applies a debuff that reduces damage to the Necromancer by 28% for 20 seconds. When Wall of Souls hits more than one target, the damage is increased by 125%. This ability is available for use in Lich form. Similar to Wall of Souls but without the added debuff and increased damage. Summons a glowing green skull and hurls it at one enemy, dealing damage. Has a 20% chance to proc an effect that resets its cooldown and allows the Necro to use it again. Rating: 8/10 – Your main “burst” ability. I say burst because if you happen to get the proc several times, this ability can deal a good deal of damage. From my experience, the max I’ve been able to throw it is around 5-6 times and that was a good chunk of the bosses’ lifebar. It also provides a good amount of Lich charges at the cost of 10% HP each time. Just be wary of your lifebar when you are able to use it multiple times as you can accidentally activate Lich form without intending to do so. Using all available Lich charges, the Necro is able to manually transform into the ghastly Lich. As explained before, the Lich is invulnerable to death itself and can restore all health lost back with several swings of its scythe withReaper’s Sweep or a couple well thrown Volley of Darkness. The Necromancer attacks the target and stacks a debuff that restores small portions of the Necromancer’s health overtime. These stacks are converted to health gains when Volley of Darkness is used on the target inflicted with said stacks. Can be traited with Blood Poisoning to increase the duration of the DoT (does not increase or change the healing effect). The Necromancer hurls a volley of glowing skulls at several targets, consuming all stacks of Sickening Nightmarepresent and restores a portion of the Necromancer’s health for each stack consumed. Has a knockback effect and can be traited with Hungry Skulls to create a stacking shield (max. 3) that absorbs damage 5% (per stack) equal to the Necro’s max HP. This ability can be traited with Veil of Death to reduce damage taken by 33% while in Lich form for 2 seconds and can be stacked to 100%. Rating: 10/10 – What can I say? This is one of the reasons why the Necromancer can outlast it’s other damaging classes. Lich is a lifesaver and can be used for both defensive and offensive purposes and is an integral mechanic of the Necromancer. 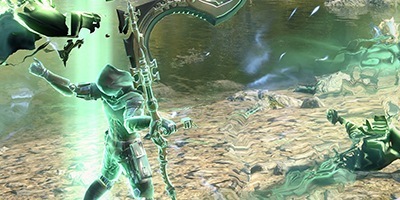 Preference to Reaper’s Sweep due to the reliability of the health restoration without needing to stack Sickening Nightmare but Volley of Darkness also has its uses when traited and useful against foes in PvP that like to kite away from the sweep. 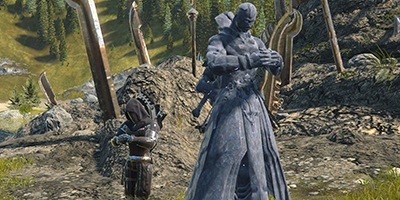 The Necromancer creates an invulnerable statue replica of himself on the battlefield. Within 6 seconds, the Necromancer is pulled back into the statue and restores their health back to the original amount they previously had the time the ability was used. Rating: 9/10 – An important tool to start any fight off. Pop this skill at full health and within the allotted 6 seconds, unleash all HP depleting skills like Skull Throw to build up Lich charges. When the 6 seconds are up, the Necromancer returns to the statue and instantly restores all the health he had back when he first created the statue. Can be traited with Beyond to reduce the cooldown of the ability by 55% and allows the Necro to manually return to the statue at any time by pressing the same skill button again. 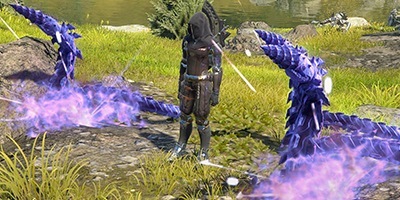 Summon: Ghostly Vipers – Three ghostly vipers appear from the ground and surround one target and take 45% of the damage intended for the Necromancer while distracting all enemies for 8 seconds. Consumes 15% of the Necromancer’s HP and provides 15 Lich charges. 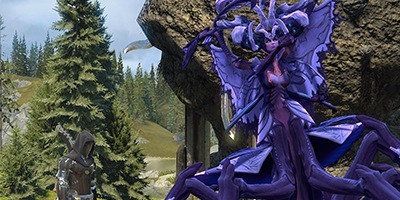 Can be traited with Cursed Vipers that will cause the vipers’ attacks to slow the enemy down by 70% and inflict 300% damage when the enemy tries to move. Killed vipers have a 75% chance of returning to the fight. Summon: Ghostly Mantide – Summons a mantide that inflicts damage to several enemies every 5 seconds. Consumes 15% of the Necromancer’s HP and provides 15 Lich charges. Summon: Ghostly Carrion – Summons a carrion that inflicts heavy damage with violent attacks to one target every 0.5 seconds. Consumes 15% of the players health and creates 15 Lich charges. Cancel – Cancels the summoning stance and return to normal stance. No cooldown. 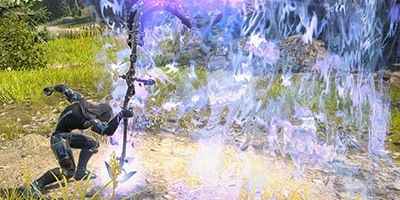 Rating: 8/10 – This set of skills are important to the Necro to help pull aggro away and also part of the rotation to optimize your damage output. Mantide should be used against multiple mobs while the Carrion should be used against big, single targets like bosses. The Necromancer absorbs all minions around him to create a dark shield that absorbs 32% of the Necromancer’s maximum health. There needs to be at least one minion present to use this ability. Rating: 8/10 – A great defensive tool. Useful for when your minions are about to die or are just standing around being fodder. Absorbs a good amount of damage and can be enhanced with a special trait available to the Necro’sTrinket. Can be traited with Barrier to make the Necro immune to all movement restricting effects, fears, and stuns while the shield is active. Useful for PvP! Using this ability increases all minions damage by 66%. Consumes 7% of the Necromancer’s HP and creates 7 Lich charges. Rating: 8/10 – The opposite of Shield of the Banished. This ability increases your damage output considerably and is preferred when heavy DPS is needed. Can be traited with Ghostly Shroud to heal all summoned allies and removes control effects during its cast time and every 3 seconds after that for 20 seconds. 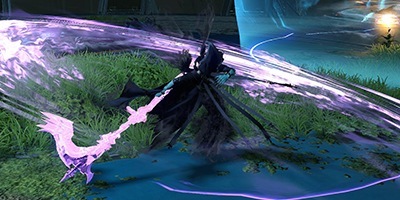 The Necromancer slices the ground with the scythe and creates an unstable rift of souls that inflicts damage in that area every 0.5 seconds for 15 seconds and applying a 4 second fear to those hit by the rift. Consumes 8% of the Necromancer’s HP and creates 8 Lich charges. Rating: 9/10 – My favorite skill to use for the 7 skill. Has great CC ability and can be traited with Torments of Hell to cause a debuff that forces crits on targets afflicted by it. Useful for dungeon mobs that group up and overwhelm in numbers. Useful in PvP for the fear. 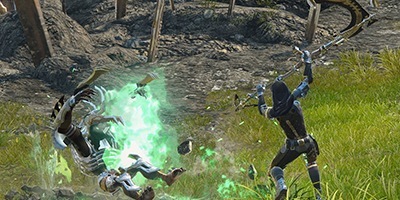 The Necromancer grabs the selected enemies and pulls them through the ground, forcibly dragging them back 20 yards away from the Necromancer and inflicts damage. Consumes 6% of the Necromancer’s HP and creates 6 Lich charges. Rating: 6/10 – It’s a cool ability and offers some spacing control when traited with Cemetery (drags all enemies to a nearby Cursed Land, if present) and paired with Cyclone, the enemies will just never reach you. To be honest I haven’t used it much so I don’t really have much experience using this in dungeon groups but I still preferRift of Horror. Definitely has some uses with PvP in that it creates breathing room and some CC. The Necromancer’s Ultimate Ability. Conjures several ghosts to damage all enemies in a line in-front of the Necro. Creates 11 Lich charges and reduces the cooldown of Lich form by 6 seconds for each enemy hit. Rating: 7/10 – It’s an underwhelming ability for sure, especially for an ultimate. Not as flashy as some of the other ultimates but it provides extra damage and some utility for 8min of CD. Can instantly regen a lot of Lich charges and allows the use of Lich form again (if previously used and is on CD) if used on multiple enemies. 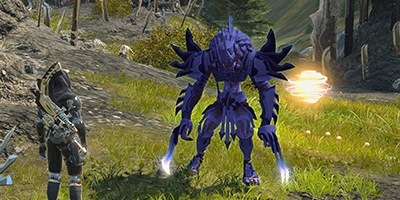 Can be traited with Rigor to interrupt enemy skills, stun and immobilize enemies hit by the skill for 1 second. Enemies will slowly recover movement speed for the next 15 seconds. Can be useful for PvP but that CD means you won’t be using it a whole lot. Ancient Sorcery – Enemies take 21% more damage if hit by Skull Throw. A PvP only trait. 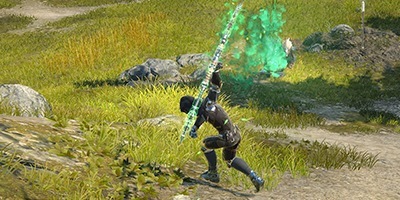 Funeral Lament – Claws of Death (Execution Skill) increases Crit chance and Crit damage of Plague by 70%. Fast Recovery – Regenerate health 100% faster when out of combat and reduce incoming traumatic damage (AoE) by 25%. Vampirism – Increases HP restoring skills used by the Lich by 12%. Funeral Lament can be quite handy in increasing Plague’s damage and Vampirism, while doesn’t increase actual damage caused (can anyone confirm?) can help bring you closer to full HP faster. Paladin Symbol (Divine Intervention) – Key symbol to get due to its OP-ness. Damage mitigation if hit by no more than 10% of max HP and becomes immune for 4 secs on a 70 second CD that resets each fight? Hell yes. Max Pally out fast. Witch/Warlock Symbol (Jinx) – Adds a DoT effect that ticks for 6 seconds. More DoTs are fun. Berserker Symbol (Frenzy) – Adds a 20% damage boost if taking damage. Higher chance to activate if low on health. Necros do damage to themselves so in theory this should activate. And we like to hover near death so…yeah. Confirmation? 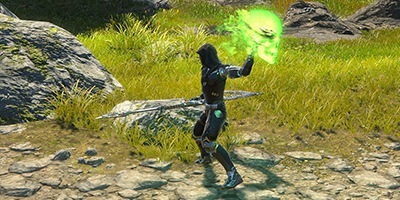 Necromancer Symbol (Ghostly Viper) – Synergizes with the trait Cursed Vipers. More minions to your army. More shield fodder! Mark of Death – Simple enough. Places a mark and when it gets removed, deals 20-30% damage total the damage inflicted on them while having the mark. Lacerate Wounds/Painful Spasms – Adds a DoT when you hit enemies with a critical/impulse damage. Attacking: Plague Chain → Hellfire Chain x3 → Plague Chain → Skull Throw → Spam Skull Throw if Procced → Whatever is off CD → Automatic Lich trigger → Reaper Sweep → ??? → Profit → OpenerIt’s important how you manage your Lich form in fights as having it on CD while you are at the brink of death will actually kill, KILL you.Ghostly Flow can save you by gaining you some Lich charges and reducing the CD of Lich almost instantly if it hit multiple times. Scythe – Best blue quality Scythe you can equip with the +65% Carrion damage. Trinket – Best blue quality Trinket you can equip with either the Shadows of the Past fear or increased Shield of the Banished absorption. Amulets – Best blue/purple quality amulets you can equip with +Plague Damage and +Skull Throw damage. Skull throw gets huge numbers in these amulets while the bonus to Plague scales really well. Rings – Best blue quality rings you can equip with Accuracy/Temper/Luck/Spirit. Temples – Upgrade your temples to get the most stamina out of them. For chapels to activate, you can either go very defensive with Endurance/Block or get the most out of your DPS with Accuracy/Temper/Violence. Mare Sacro Monastery – Not much to say about this dungeon. It is the first dungeon accessible to beginners and it’s pretty tough if your group doesn’t know what they’re doing or are not very coordinate on what to kill first. If you have a good tank, then by all means go all out with your skills. First boss, Cetus, should be easy as you can nuke both the boss and the adds at the same time with Hellfire. Just keep your Plague up on the boss and he should be cake. The last boss, Leida the Conqueror, is quite easy as well. Just avoid the geysers and when the shield comes up, kill the two naiads and repeat. Daren Facility – Probably the first dungeon you’ll have multiple wipes in unless you have an adequately prepared party. Same as always, nuke and AoE trash mobs, avoid thorns from the Dryads. The first boss, Corthinarius, is pretty simple once you know the mechanic. I like to sit in one of the side rooms and just hang there while waiting for the adds to spawn, all the while bombarding the boss with DoTs and Ghostly Carrion. These rooms are safe from ALL of Corthinarius‘ attacks, especially the AoE slam. DPS the adds as they come and you should be good to go. Remember to keep your Plague up at all times! You will then come to the infamous sneaking part where you have to navigate a corridor filled with nasty, overtuned mobs with 4x life bars. The trick is to run into the side rooms away from their line of sight and killing the other trash mobs along the way. May take some practice but you will eventually know the pattern of their movement and which places to hide. Before you come to the final boss, you will fight waves of adds. Just nuke them down and kill as usual. The final boss, Restless Ethedra, is pretty easy. Typical tank and spank but will sometimes fear the group. It doesn’t do a whole lot else so just nuke it down hard. Hespilon Temple – A pretty straightforward dungeon. It’s mostly a straight pathway that has mobs. Just follow your tanks lead and coordinate attacks and everything should be cake. The first boss, Asmos, is also pretty straightforward. Just avoid being in-front of the boss as it does a scream attack that hurts. Nuke the boss down and it will keep summoning adds. By the end of the fight, it will have summoned so many that you can’t possibly keep up (unless you have the DPS). Just nuke it down before things get out of hand! After this boss is more mobs. Again, coordinate attacks and with enough tenacity you shall prevail. The last boss, Niatus, has a somewhat interesting mechanic. The room you will fight him in has several pillars. These will be your safe haven when he starts to yell “You can’t hide from death!”. That’s your cue to hide behind the pillars and away from his line of sight to avoid being feared and taking damage. The one important thing to remember is to hide in separate pillars and NOT grouped up together. Why? Because he will teleport and instagib you if you’re next to 2+ people. So don’t cluster up and just nuke him down. Symbols section: There’s a mistake: you are describing Lightbinder’s symbol while naming it Paladin’s Symbol…. Man, could you explain why these stats ( Accuracy/Temper/Luck/Spirit ) have priority ? I was building STR/LCK, but i feeling no dmg. very well done will be using this guide for my necro thanks a bunch for doing this.